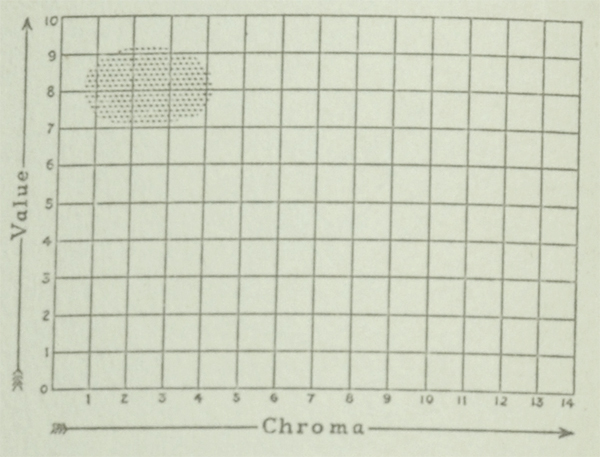 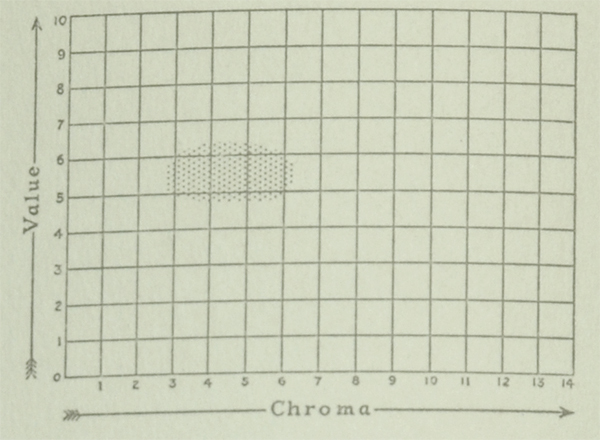 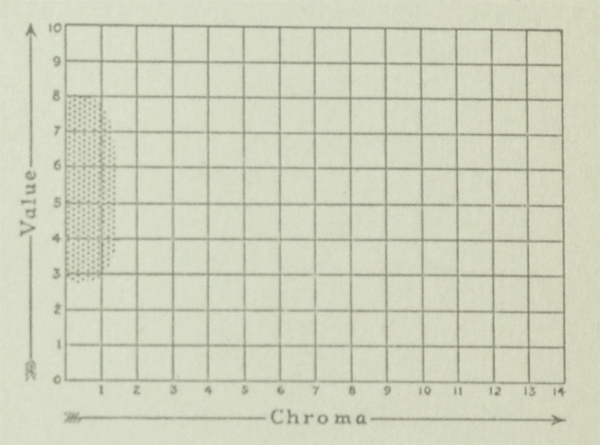 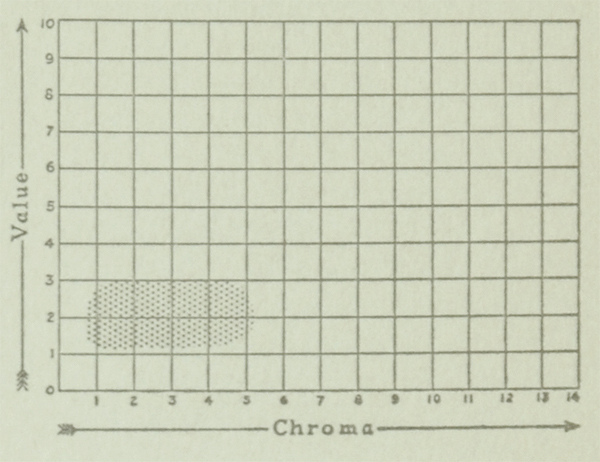 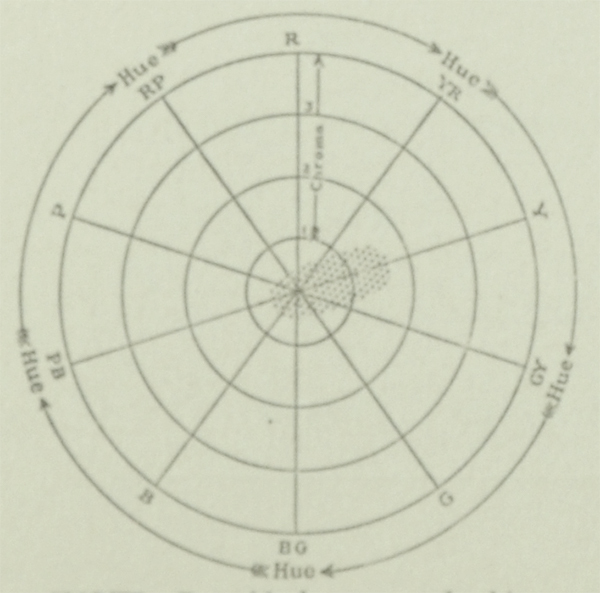 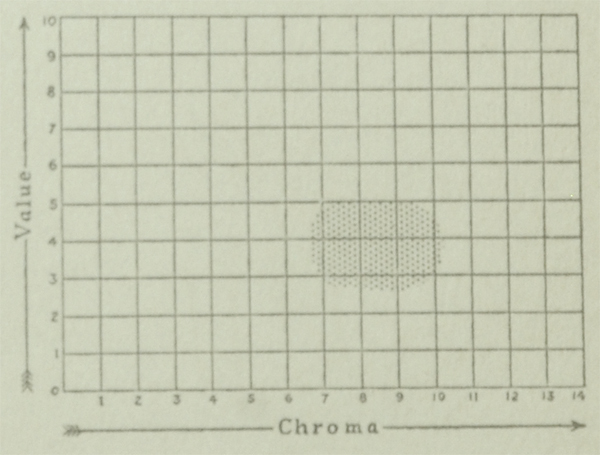 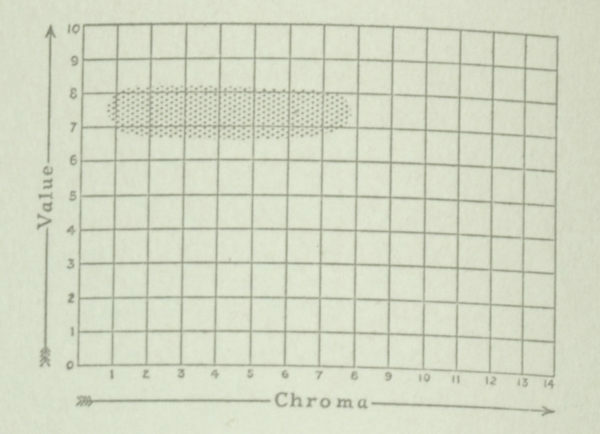 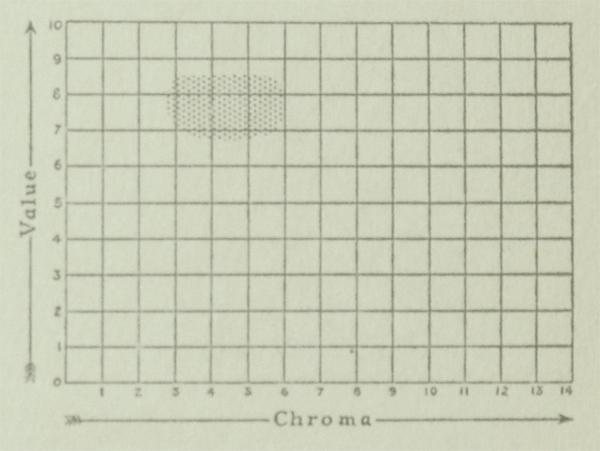 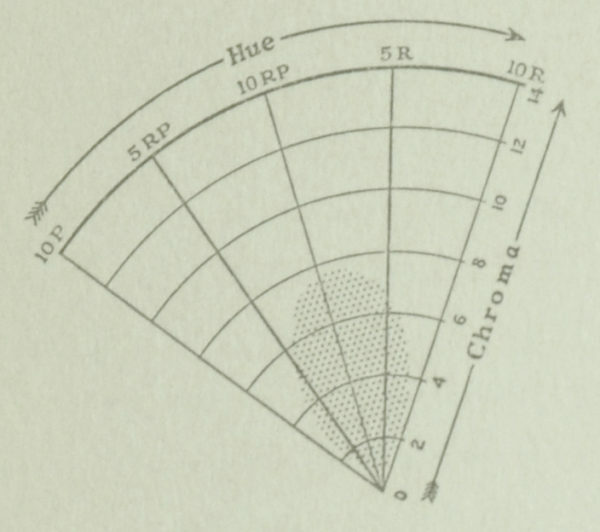 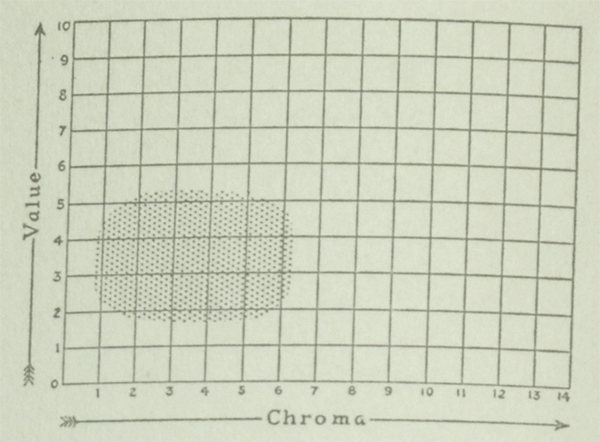 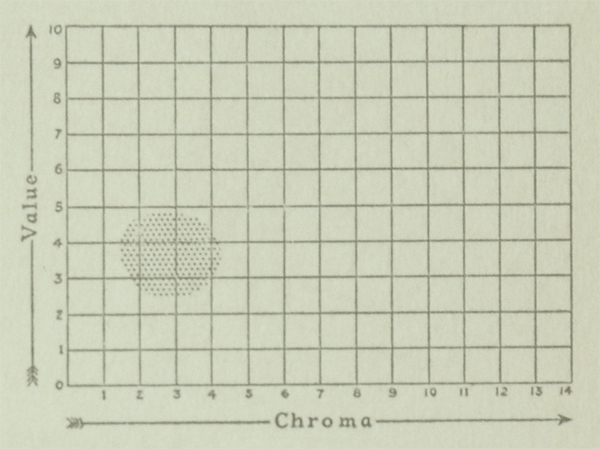 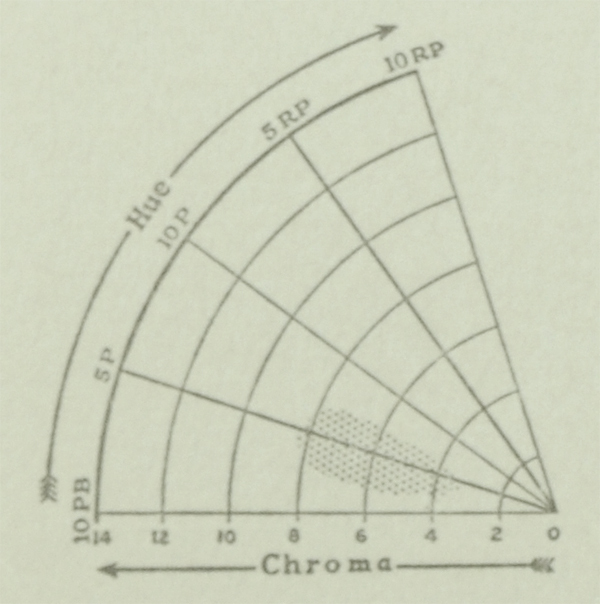 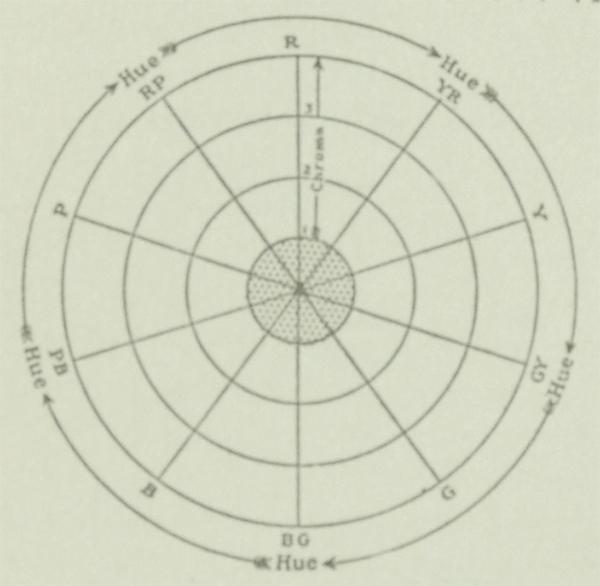 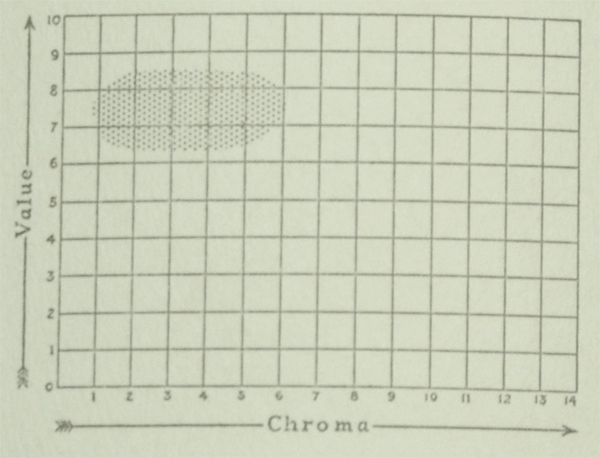 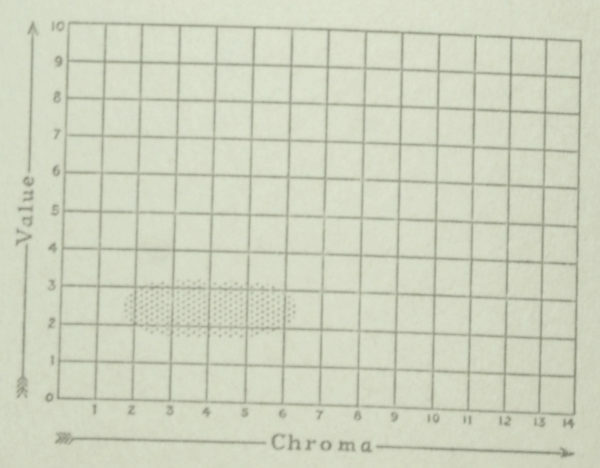 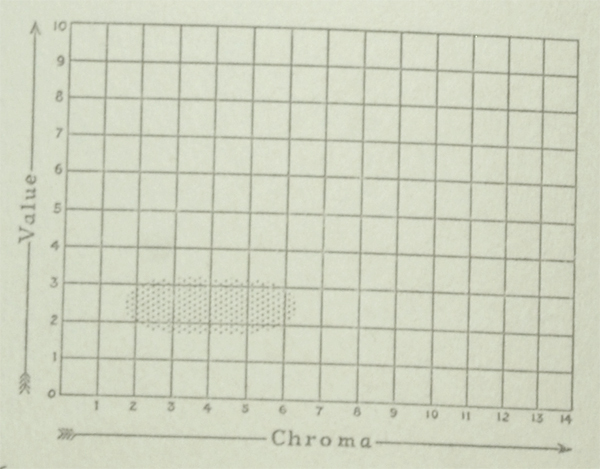 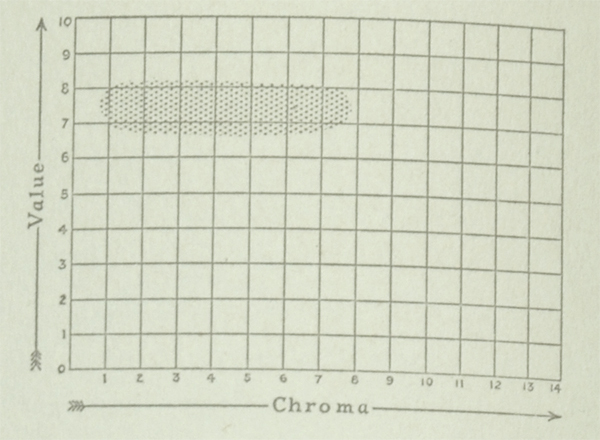 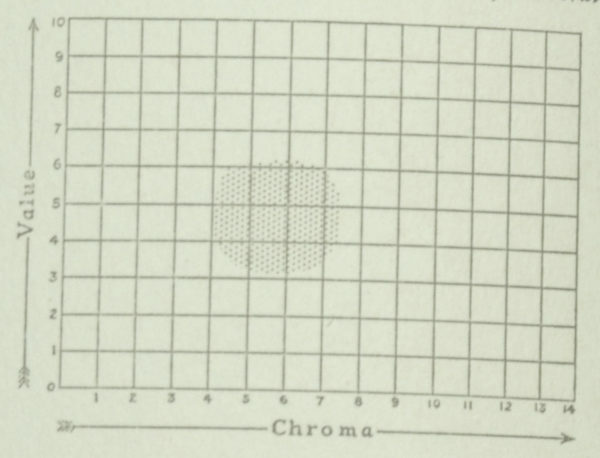 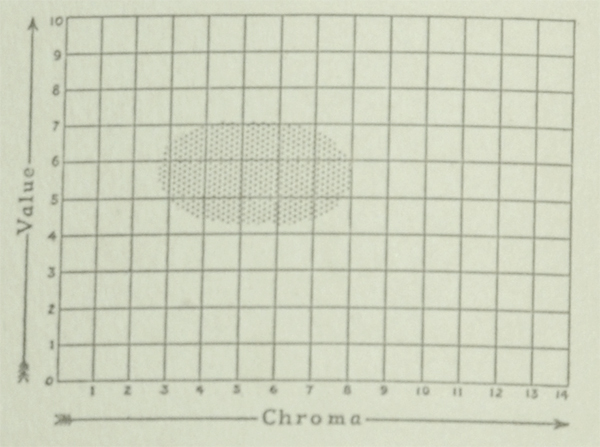 In this section of the 1st edition of the Munsell Book of Color from 1929, 24 traditional color names are identified along with charts outlining their hue, value and chroma. 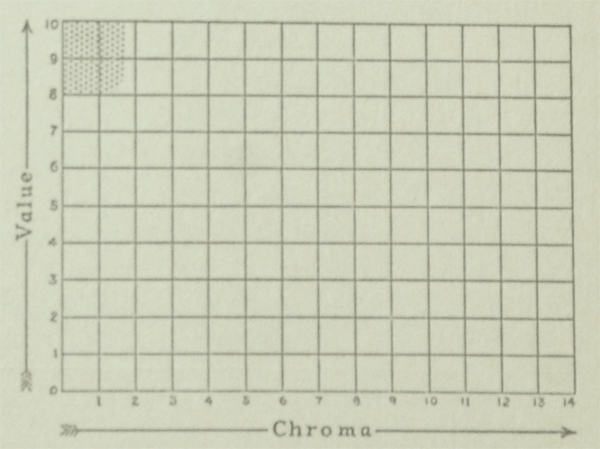 A study of over 2,000 names colors which have been collected from sample cards and various other sources, leads to the conclusion that color names may be divided into two groups. 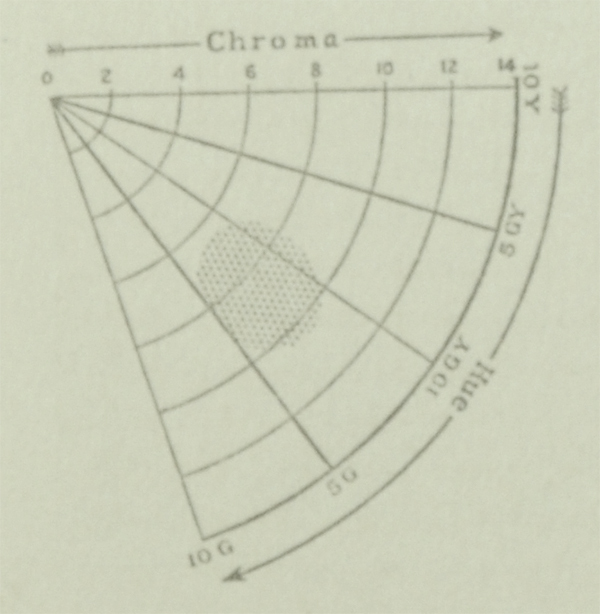 Certain color names, such as “pink,” “brown,” “orange,” etc., have a traditional association with fairly definite areas or ranges of colors. 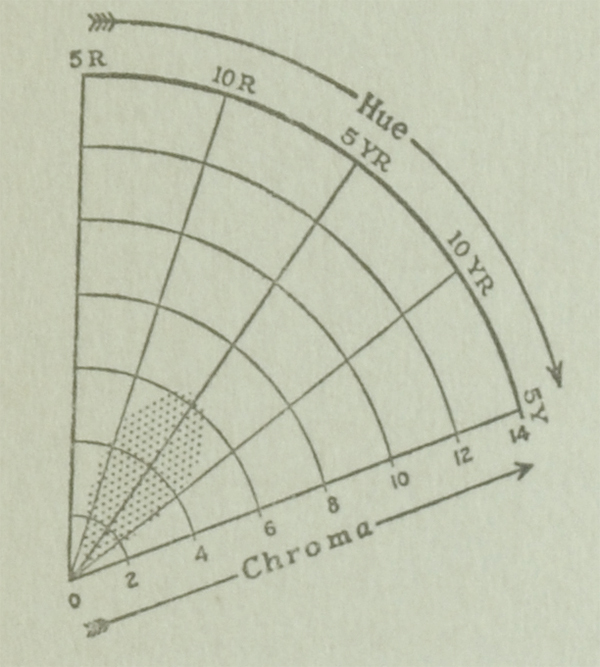 On the other hand, many other color names are of more recent origin and have not been used with the necessary definiteness for a sufficient length of time to warrant classifying them as traditional color names. 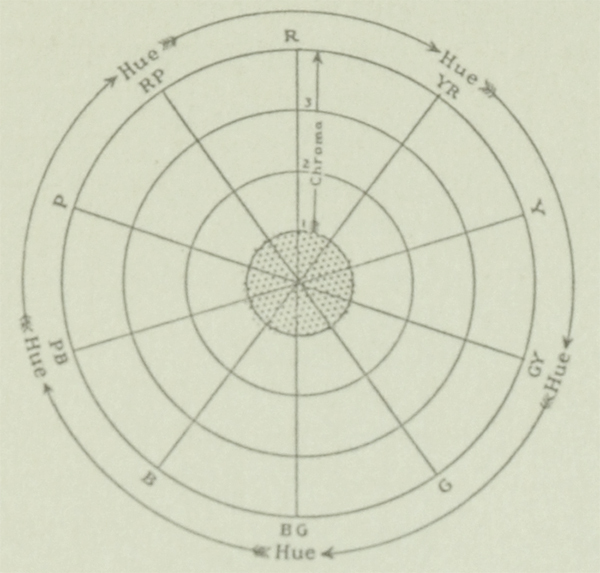 The student of color in his own work should, if possible, avoid the use of traditional color names, because they apply to areas of color rather than to specific colors. 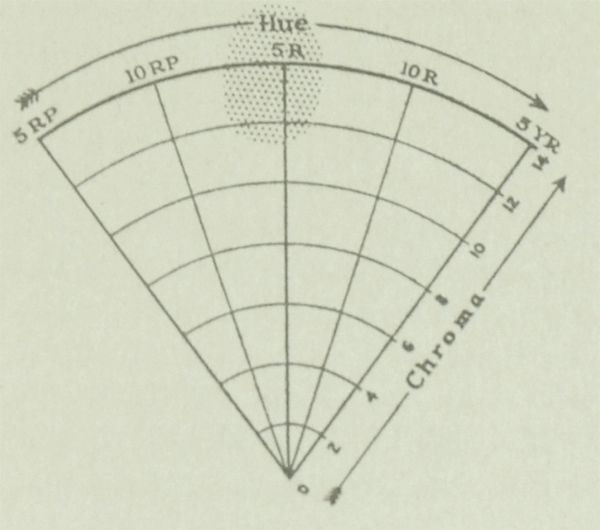 It is only by recognizing and using the three dimensions of color that he can accurately comprehend and describe the difference between any two colors, and especially between any two “pinks,” “browns,” etc. 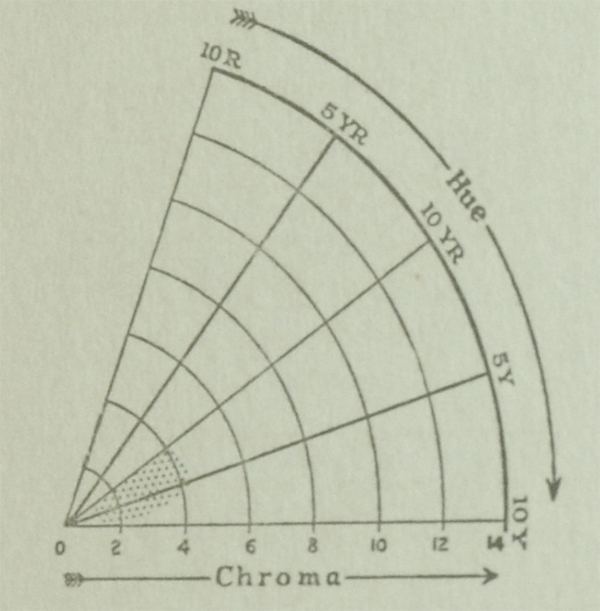 However, in describing color to those who have not had the opportunity of studying the simple method of color notation described in this book, it is sometimes helpful to know the correlation between this exact color notation and traditional color names. 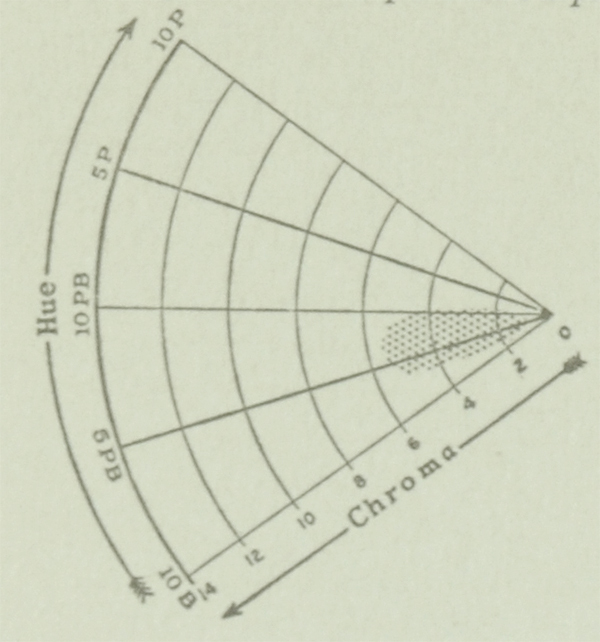 For this reason, twenty-four of the most common names are summarized on the following pages. 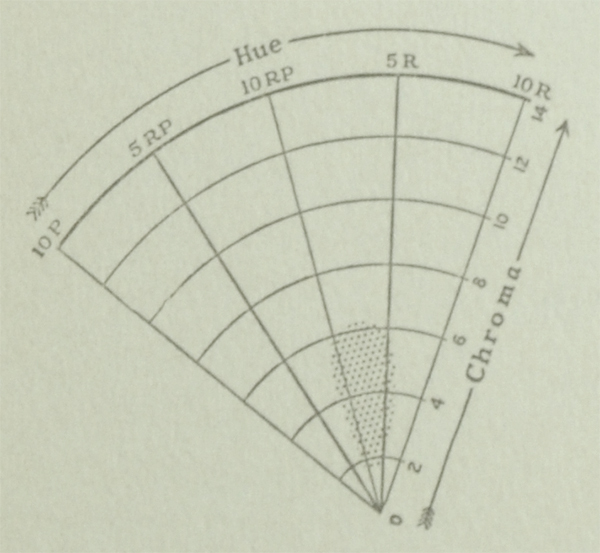 Each name, of course, represents a group of colors, the limits of which have been more or less clearly defined by usage. 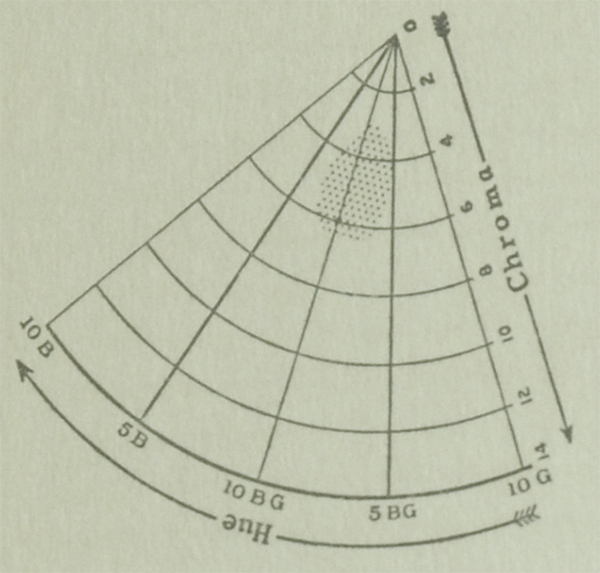 The approximate extent of each group is given directly under the Group Name. 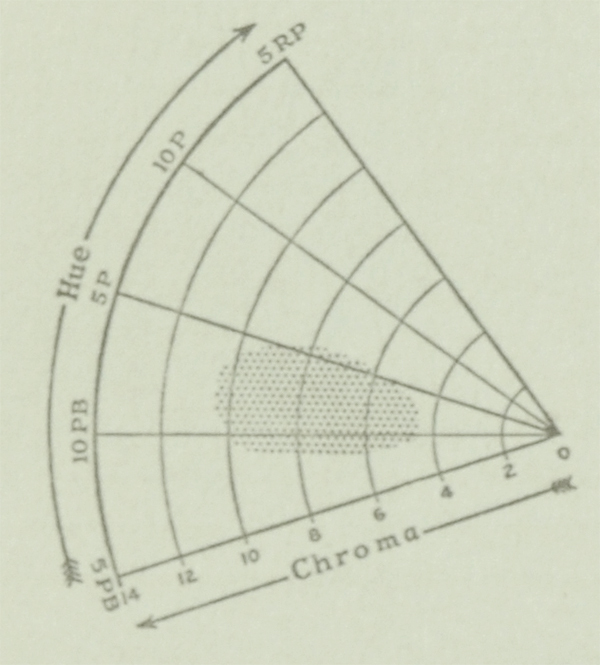 Thus the term “Pink” (see group No. 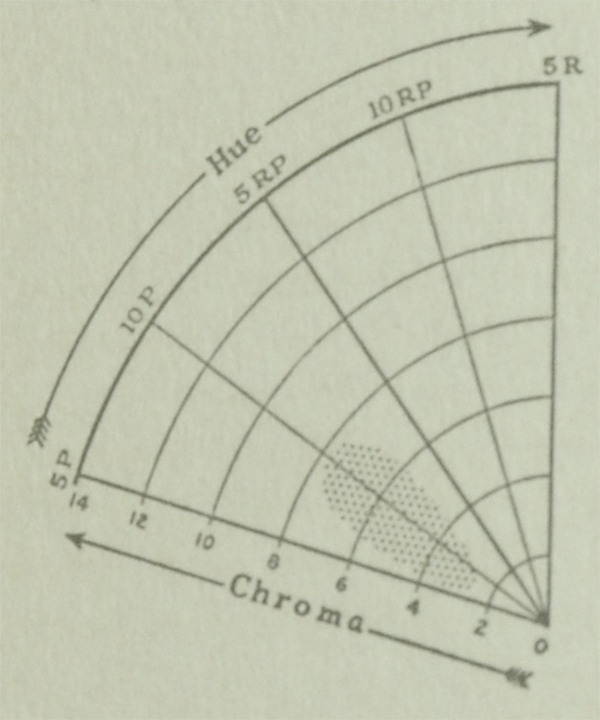 1) is applied to a range of colors extending from about Red-Purple to Red Yellow-Red in HUE, all of which colors are light in VALUE and moderate in CHROMA. 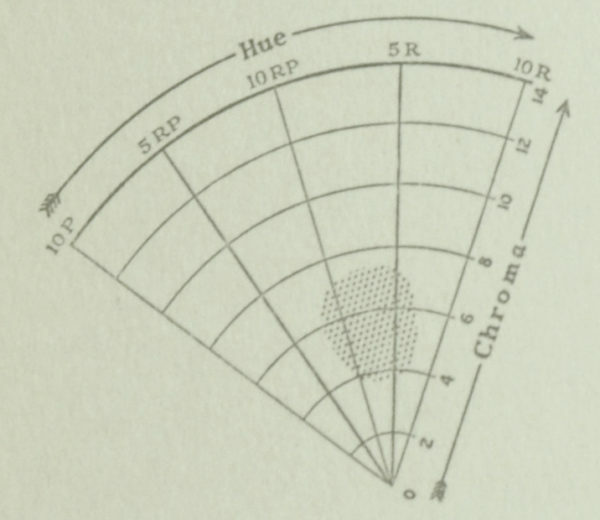 Below this simple word description of the group is a pair of graphs. 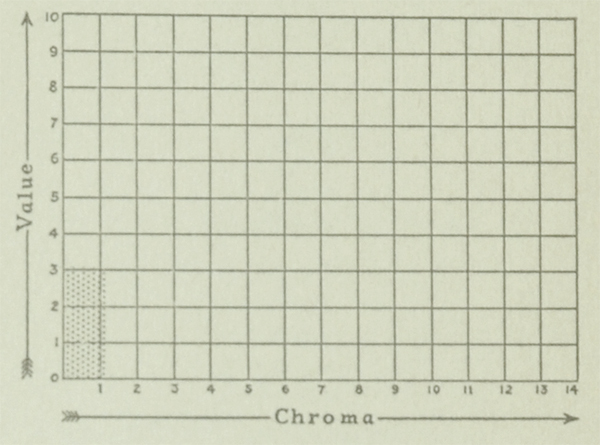 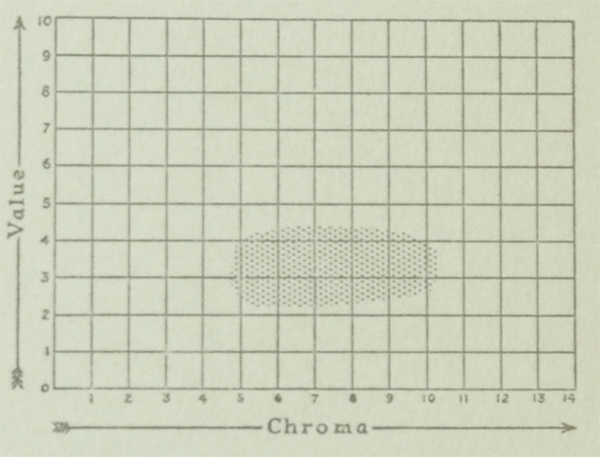 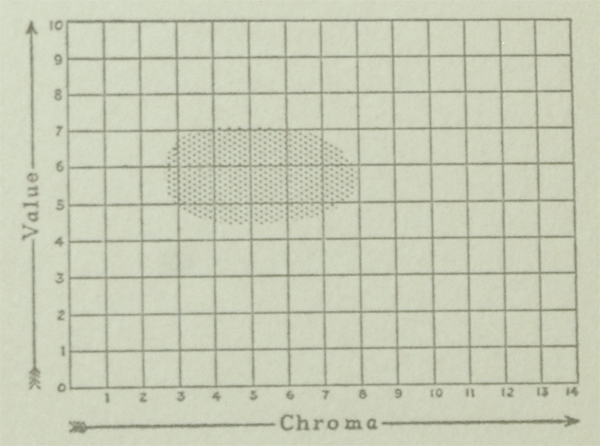 The shaded portion of the graph on the left indicates the limits of the HUE and CHROMA. 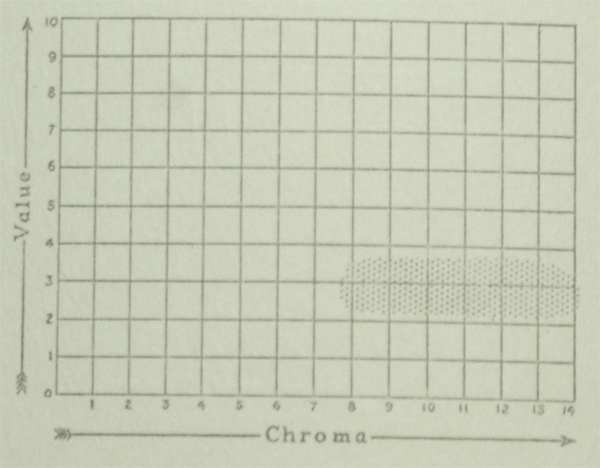 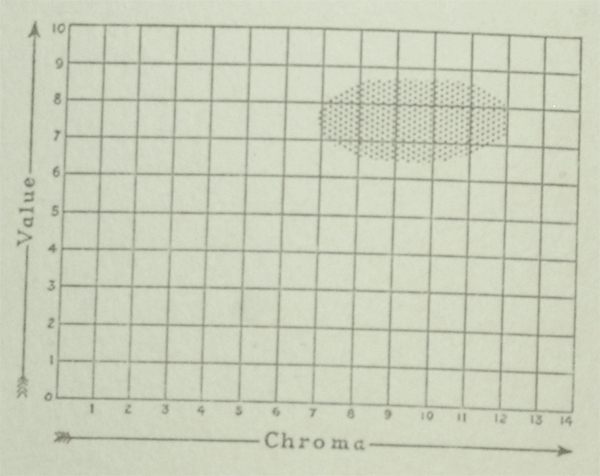 The shaded portion of the graph on the right indicates the limits of VALUE and CHROMA. 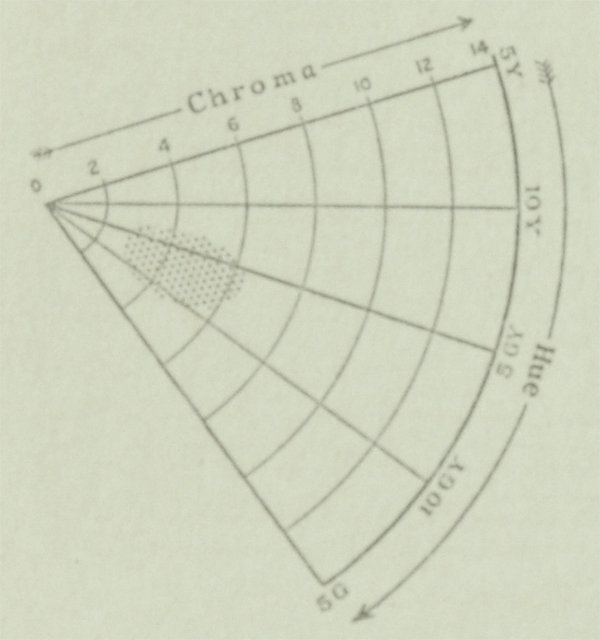 The survey, upon which this work is based, brought out the interesting fact that certain portions of the areas covered by many of the twenty-four color groups might be occupied by colors bearing closely related color names. 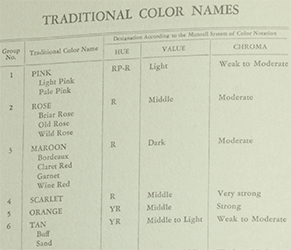 For instance, “Garnet,” “Bourdeaux,” “Claret Red,” and “Wine Red” were found to lie within the MAROON Group. 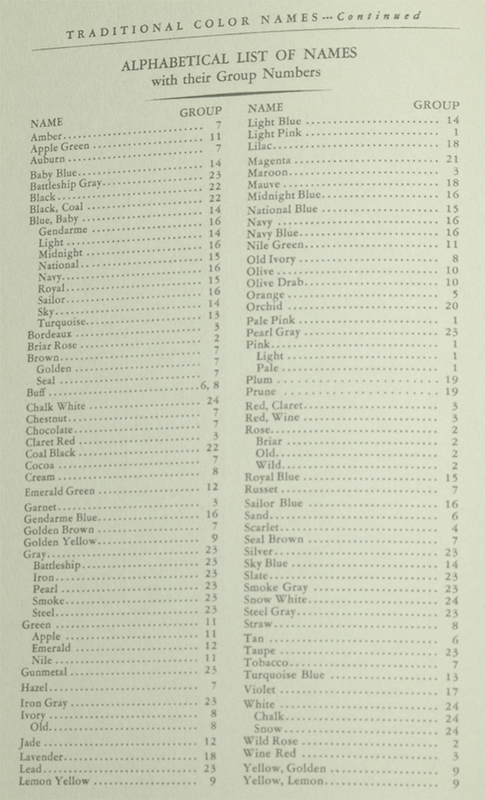 Such color names are listed under their appropriate group headings on page 34. 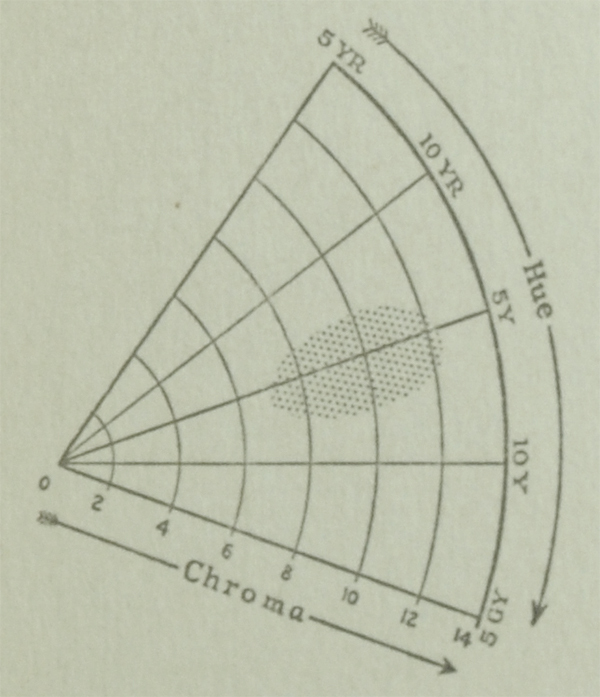 In this list, for the sake of simplicity, the average HUE which is most typical of each group is indicated by its symbol. 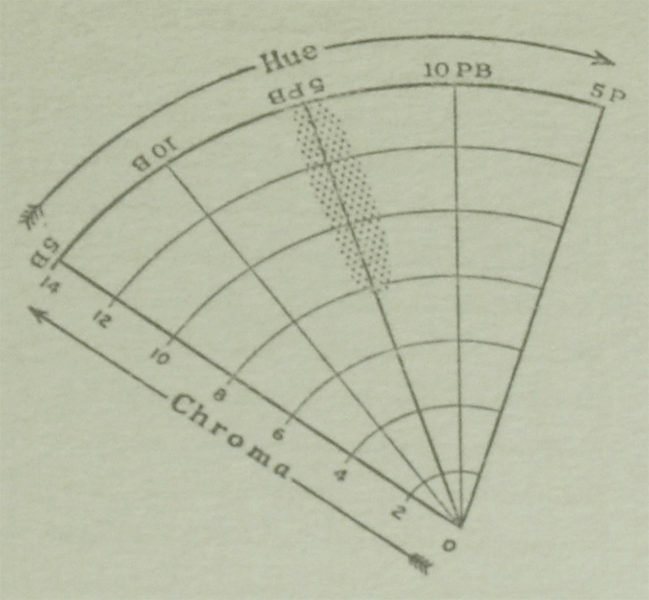 On page 36 there is an alphabetical list of all the color name which were studied, with a cross reference to the group in which they are located. 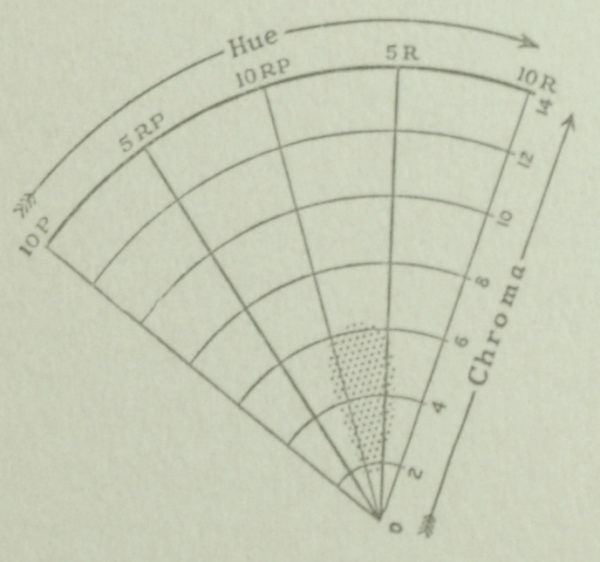 *NOTE… Pure black, gray and white posses neither HUE nor CHROMA, being characterized only by VALUE. 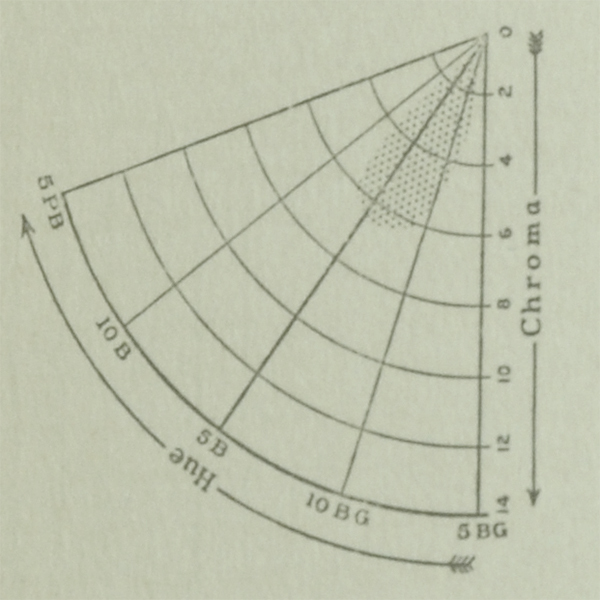 In the traditional use of these name, however, they are applied to practically every color whose CHROMA is not greater than one. 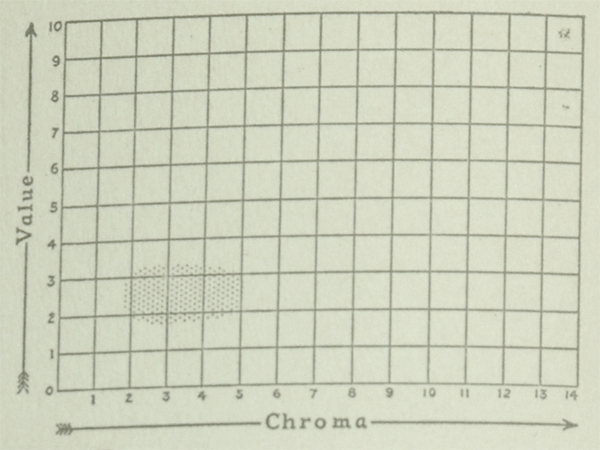 This fact is indicated by the shaded areas on the above charts. 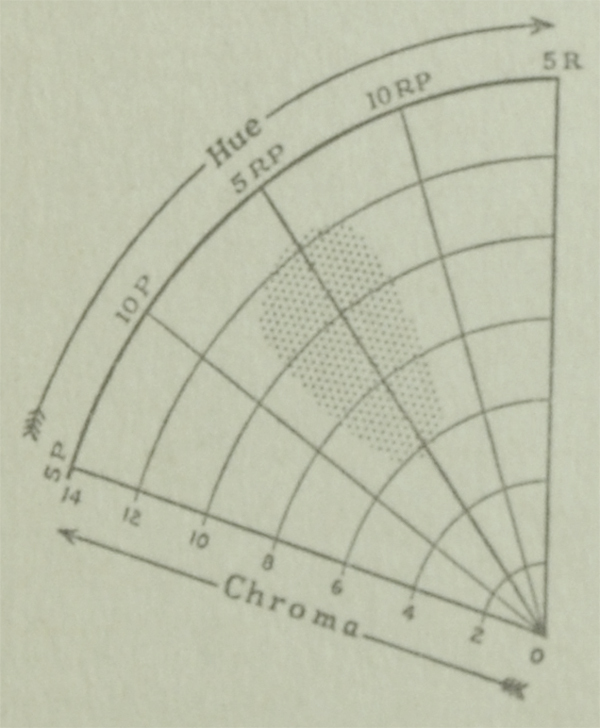 I note that the ORANGE group images are wrong. 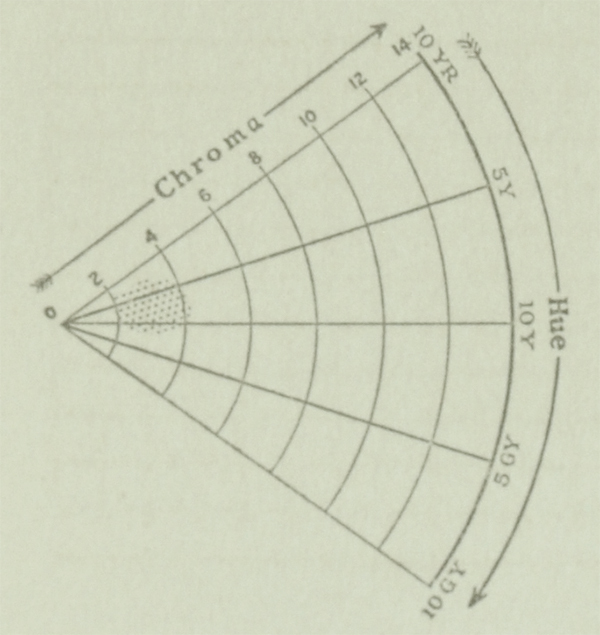 They are a repeat of the ROSE group images. 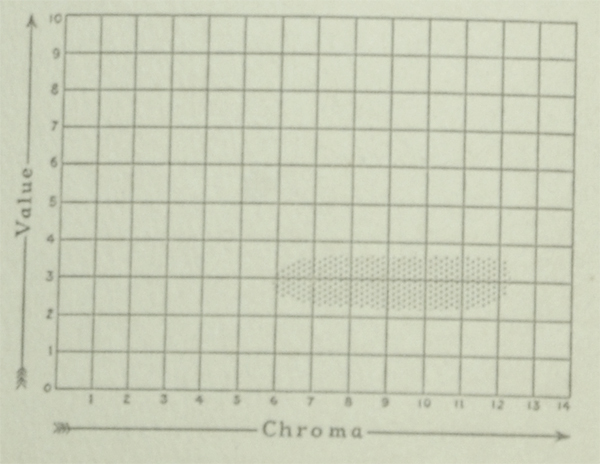 Good catch! 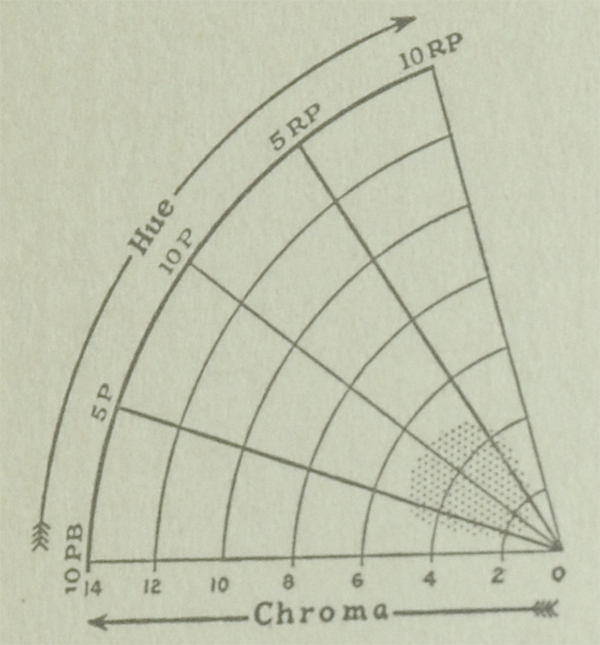 We have updated this.